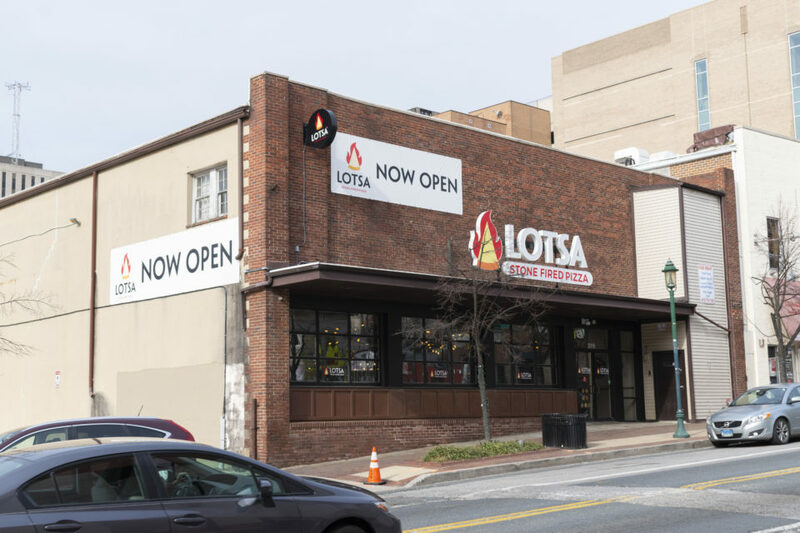 In an effort to identify the best aspects of the Towson area, the Towerlight conducted an online survey in which readers could vote on their favorite parts of the Towson community. You voted on your favorite food spots, study locations, residence buildings, athletes, coaches and much more! Now, it’s time to reveal the results for Towson’s Best. One of the newer buildings on campus, the Liberal Arts building, which opened in 2011, has some of the nicest bathrooms on campus. With there being bathrooms on all levels of the five-floor building, there is a high chance the bathroom will not be crowded. The Liberal Arts bathroom stalls also close, not leaving a crack of light between you and the outside world. They also have nice Dyson hand-dryers and are located in a convenient spot of campus close to the library and the University Union. If you’re looking for a nice, clean, less-crowded place to do your business, the Liberal Arts building is likely your best bet! The Liberal Arts buildings won best bathrooms, holding restrooms on all five of its floors. LA also won best academic building due to its slew of study spots and iconic light display. 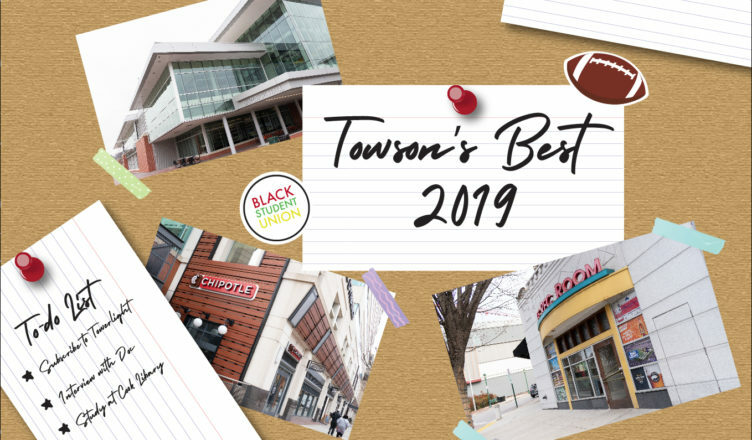 Apparently Towson Best really is Towson’s best! Towson Best Chinese food has a wide variety of options including sushi, fried rice, chow mein, vegetarian-friendly options and more! Conveniently located on York Road, Towson Best is only a four minute drive from campus, allowing for quick delivery or carry out. You can even order online! Towson Best is a student-selected favorite for some fresh hot chinese food to be delivered to your dorm for a nice dinner before a long study sesh! Towson Tigers love Chipotle! From their classic burritos and burrito bowls to quesadillas and tacos, your Mexican food cravings will be cured with a quick trip to Towson’s Chipotle locations. Luckily, Towson students have two Chipotle locations each less than a mile away – one on Goucher Boulevard and one on York Road, so fresh and healthy burrito bowls will only ever be at arms’ reach! Just remember, the guacamole is extra! In his first season as starting quarterback for the Tigers, redshirt junior quarterback Tom Flacco helped to spark an offense that finished the regular season first in the Colonial Athletic Association (CAA) in passing yards and scoring. Flacco finished the season with 3,251 yards and 28 touchdowns passing along with 742 yards and four touchdowns rushing. Flacco was named CAA Offensive Player of the Year and finished fifth for the Walter Payton Award for National Player of the Year. 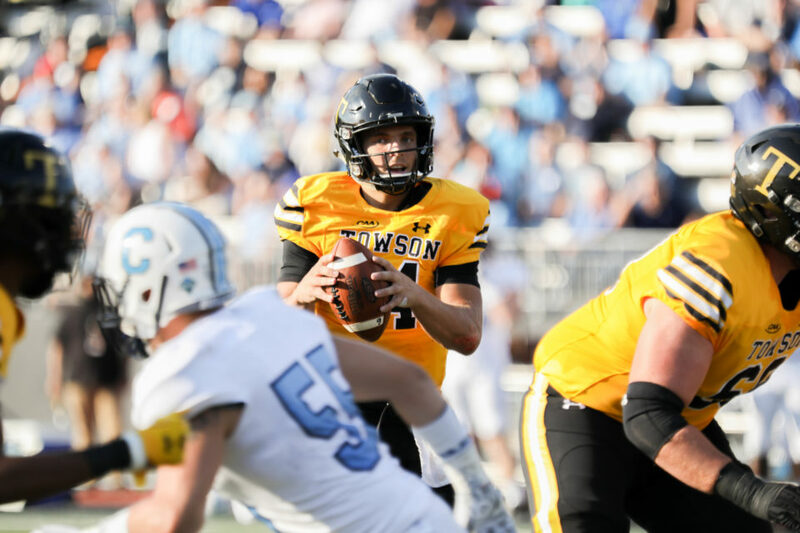 The younger brother of Baltimore Ravens quarterback Joe Flacco, Tom has gained local and national attention for his strong season that helped Towson reach the playoffs for the first time since 2013. His dual threat abilities make him a nightmare for opposing defenses to plan for and that has resulted in a renewed sense of pride in the football team among Towson students. Flacco is also listed as an outfielder on the baseball team this season, making him a dual-sport athlete, a difficult feat to accomplish in collegiate sports. Redshirt junior quarterback Tom Flacco helped guide the Tigers to their first playoff appearance since 2013, earning him Towson’s best male athlete. A man who preaches loyalty to Towson University, Head Football Coach Rob Ambrose entered his tenth season believing his team was far better than the tenth place conference preseason prediction they were given. Ambrose proved the “experts” wrong when the Tigers raced out to a 6-1 start to the season as Towson climbed into the top-10 national rankings. Led on offense by redshirt junior quarterback Tom Flacco and redshirt junior running back Shane Simpson, Towson had the most efficient offense in the conference and reached the playoffs for the first time since 2013. Ambrose isn’t lacking in passion for Towson and you see that in his players’ rendition of the “Hail Towson!” after victories and during the playoff selection special this past season. Tiger football has become synonymous with the Ambrose family as Rob’s brother Jared is the offensive coordinator. A former player and assistant coach at Towson, Rob sets the standard for commitment to the Towson. 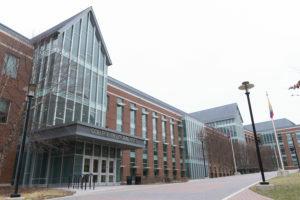 One of the newest buildings on campus, SECU Arena opened in the fall of 2013 and is the home of Towson’s volleyball, gymnastics and men’s and women’s basketball programs. With a seating capacity of 5,200, SECU Arena is also the perfect venue for hosting concerts and commencements. The entire venue is Wifi accessible, boasts two ATMs, a hospitality room which hosts boosters and donor before basketball games, a multipurpose room and a modern videoboard system that makes viewing events here a must if you’re at Towson. The bathrooms are always clean and provide both hand dryers and paper towel dispensers which shows the university’s efforts toward a greener campus and their desire to ensure every visitor to SECU Arena is satisfied. With numerous parking lots within a short walking distance to the arena, fans don’t have to worry about a difficult commute in or out of SECU. 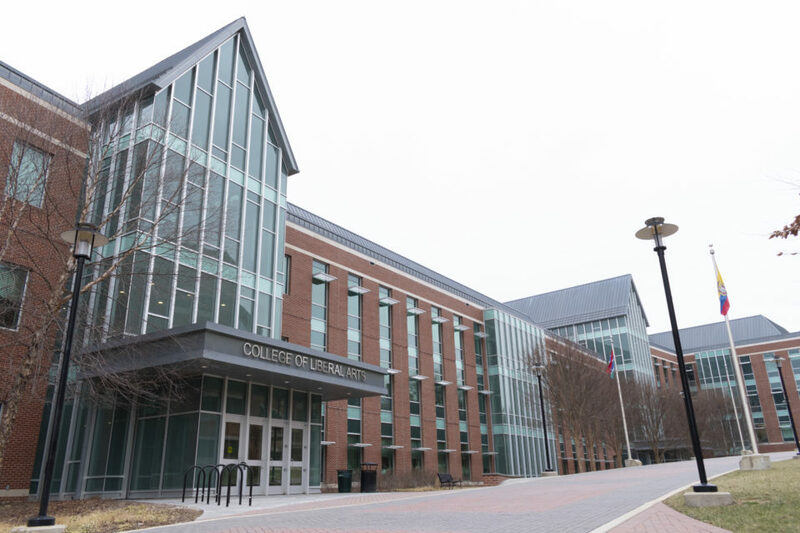 As the rest of the campus undergoes construction over the next few years, look to SECU Arena as an example of the future of Towson University. Often thought of as the university’s living room and the heart of campus, students are most excited for the expansion and renovation of the University Union out of all ongoing construction projects. Students look forward to a more open, inviting, spacious layout of the Union, providing more room for less crowded places to chill and hang out in between classes and more opportunities to grab a quick bite to eat. There will be a new food market in the new and improved Union with food venues like Chick-fil-A and Dunkin Donuts. The 85,000 square feet expansion of the Union is expected to be completed in the fall of 2020 and renovations are slated for completion in fall of 2021. The Washington Capitals captured their first Stanley Cup Championship in June and the impact of their success is seen on campus every day. During their playoff run in the spring of 2018, countless students could be seen roaming campus wearing Caps jerseys, shirts and hats. Football reigns supreme in Baltimore so when Ravens season ends, there is a desire for fans to turn to a sport before baseball season begins, and that is where the Capitals come in. Having reached the playoffs in 10 of the last 11 seasons, the Capitals have been a consistent team of success while the Orioles and Ravens have gone through peaks and valleys over the last decade. Their energetic captain Alex Ovechkin continues to lead the league in goal scoring despite being in his mid-30s. Winger T.J. Oshie is a fan favorite after his heroic performance for Team USA in the 2014 Olympics. The Capitals also have a slew of younger players such as Evgeny Kuznetsov, Andre Burakovsky and Jakub Vrana who can ensure that this team will continue their winning ways for years to come with hopes of more Stanley Cups on the way. When it comes to getting a quick bite to eat on campus, students can rely on the Chick-fil-A station, located within University Union’s Susquehanna dining area. The station currently has limited food choices, serving only chicken sandwiches, nuggets and fries (each with different size options), however the speed and quality of the food makes it a popular choice for students here at Towson. The station has a grab-and-go method, where rather than waiting for specific orders to be placed, Chick-fil-A’s staffers just continuously make food, placing them on warmers for students to grab as they desire. This is definitely the place to go on campus when you’re short on time yet want something warm and ready-made. Bonus points for the Chick-fil-A sauce you can pick up at any of the registers as you check out. The Union Garage stands tall at the center of campus, giving community members easy access to all parts of campus. 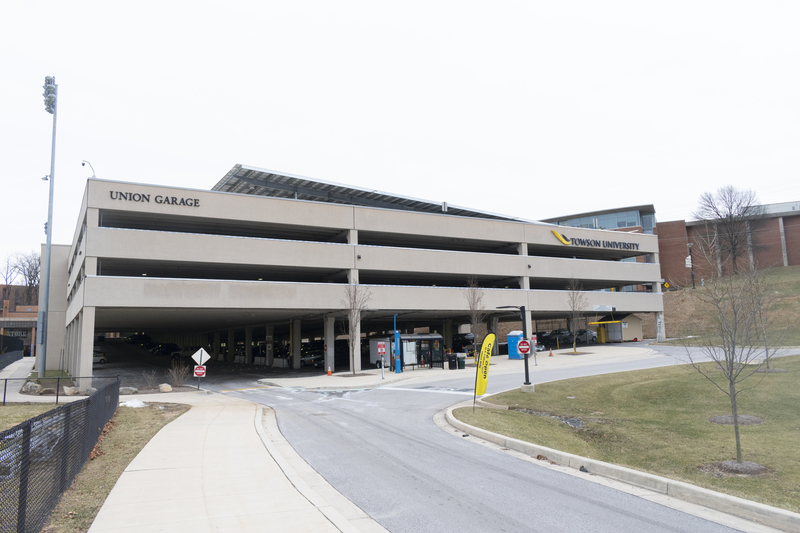 Out of all the places to park on campus, the Union Garage is the one location that you’ll have the best chance of getting relatively convenient parking. 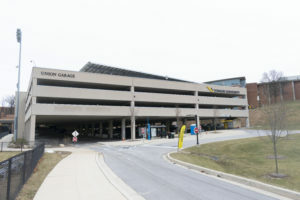 Located in the center of campus, this garage holds two entrances, with both leveled and rooftop parking. Although students cannot park here without a “CORE” parking permit (which is only obtainable if you have at least 30 credits under your belt), the garage allows those who park there to have a fair walking distance from either end of campus. Additionally, it’s attachment to the University Union makes it more convenient for students who frequent that building. The Union Garage does fill up near the middle of the day, however, the frequent flow of students arriving and leaving campus allows for there to be a better likelihood of finding parking here. Finding a quiet and calm place to study on campus couldn’t be easier, thanks to Cook Library. The facility has various study spaces to choose from, depending on a person’s needs. Located in the main entrance to Cook Library is Starbucks, where students can study while listening to smooth jazz and indulging in the latest seasonal coffee flavors. This location is most useful for those studying in pairs or groups, since the expectation of silence is low. The library has lobby areas on each floor that contain tables students can gather at. These tables have outlets attached, making these areas ideal for those using their own technology. The actual book areas of the libraries also house tables for group meetings, and each aisle is also lined with individual computers and desks for those looking to study solo. For more silence, students can seek out the individual study cubbies located on the bottom levels of the library. For those who need additional resources, closed-off group study areas are available on each floor of the library as well, where each group cubby contains a Mac computer, white board and meeting table. Let’s give a big round of applause to West Village Commons (WVC). Despite all the renovations made to Newell Dining Hall and Au Bon Pain’s delicious assortment of sandwiches and salads, WVC was voted the best dining hall on campus. Some of you may be wondering how, but let’s be real here, with an open layout, big windows and a multitude of made-to-order food stations, it’s no surprise that it’s the first place winner of best dining hall of 2019. Some of WVC’s other amazing features include an all day omelette bar for those of us who don’t like to eat breakfast in the morning and a pretty sweet salad bar for people looking to get in their greens (or pasta salad because that counts as salad too). And let’s not forget the dessert bar. That thing is always loaded with some of the best treats around. Ah, the good ‘ole Liberal Arts Building. With its intricate light displays that can be seen across campus on a clear night, numerous WEPA printing stations and always quiet study spots, this building is for sure one of the best on campus. Whether you’re looking for a place to study by yourself or get together with classmates to throw together that project you’ve been putting off, CLA has everything you need to get the job done. It even has the LA Cafe on the fourth floor in case you need that quick refuel between classes. You can get coffee for your caffeine fix, sandwiches for lunch or a number of breakfast items in the morning if you didn’t have time to toast your bagel before leaving for class. Burdick Hall has a fitness facility that is open over 100 hours per week, encouraging students to remain active. Right across from TU’s central hub, Towson Place takes the cake when it comes to the best off-campus apartment complex. With controlled building access, 24 hour emergency maintenance and the ability to pay your rent online, Towson Place makes living easy. The apartments also comes fully furnished, and its all-inclusive rent covers utilities, cable and high speed internet. And did we mention just how close to campus it is? Walking the 0.44 miles to class is simple with paths to campus. On top of all this, the apartments are now pet friendly. Why live anywhere else when your animal friend is, tops, a 15 minute walk from wherever you are on Towson’s campus? I can’t think of a single reason to lease an apartment anywhere else. Now that the new and improved version of Burdick has been open for a year, we can officially say that students like it more than other gyms in the area. Yeah, there have been hiccups along the way, like that time it flooded, but all in all it’s a pretty great place to get those gains. There’s no shortage of cardio machines, the weights are spread out across the entire first floor making it easy to pick what you want to work on and most of the second floor is dedicated to fitness studios and dynamic training areas. But wait, there’s more! It also has a bottom floor with a heavy bag room and a cycling studio. 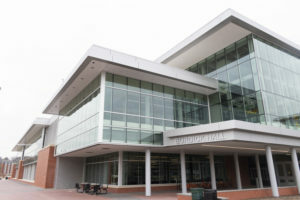 On top of that, the bottom floor is home to the different courts where members of the Towson community can be seen playing sports like badminton and volleyball. And all the basketball courts are still there, tucked away behind the locker rooms. There are just so many ways to get that beach body you’ve always wanted, and you don’t have to leave campus. What can I say? Lotsa is popular. If you ask, most people will tell you to get your pizza from Lotsa. 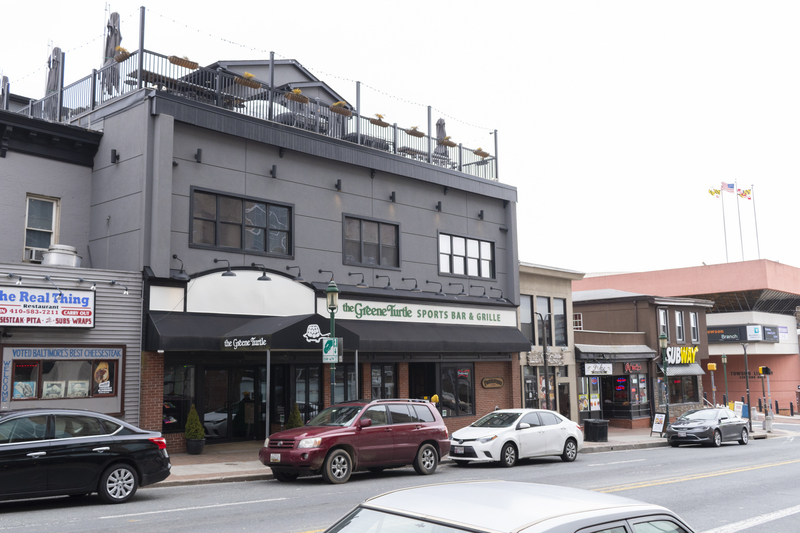 Located Uptown right down the street from The Green Turtle (but on the opposite side), it’s perfect for any occasion. Got a date? Take them to Lotsa. Had a drink or two and are craving pizza? Lotsa is right there. Looking to stay in but don’t know what to get? Order Lotsa. It’s the answer to everything. Signature classics like the Bianca or the Carnivore are sure to get your mouth watering, and if they don’t there’s no reason to fret. You can build your own stone-fired pizza from a wide array of pizza doughs, sauces and toppings. Heck, they even have a gluten free dough and a vegan cheese. There’s something for everyone at Lotsa! With a bevy of toppings and tastes, Lotsa won best pizza place. Are you tired of living in the traditional dorm, but aren’t ready to move off campus? Check out Millennium Hall. These on-campus apartments are sure to have you sleeping comfortably in no time. These apartments come fully furnished, and everyone gets their own bedroom. Though your bathroom may not be totally private since you have to share with your housemates, the fully equipped kitchen totally makes up for it. With a fridge, dishwasher, microwave and full size electric stove and oven, you no longer have to worry about a meal plan. That is, if you don’t want to. Meal plans can still be convenient if you live in Millenium, especially if you’re looking to try out that omelette station in West Village. Millenium also has study lounges on each floor, and laundry facilities on site. We also can’t forget that it is, like all residence halls on campus, OneCard secure. Let’s face it. We’ve all had days where we walk all the way across campus and end up completely wiped out from the hike. Instead of walking between buildings, which can also be a trek depending on where you’re headed, you can simply hop on the shuttle. Which one’s the best? TU’s Black Express Route. Though the Gold Route also goes around campus, the Black Express Route only goes around the core of campus, dropping you off at the stop closest to your next destination without taking you to the stadium and through West Village. It is by far the fastest way to get from place to place if you don’t want to walk, if it’s raining or simply too darn far to make it to your next class on time by any other method. Next time you’re in a hurry, hop on the shuttle and make your way across campus in time for that class you simply can’t miss again. Having been a part of Towson’s community for over 40 years, the Black Student Union (BSU) is one of the most popular student groups on Towson’s campus. The BSU states its mission is to provide “services and support for all black minds at Towson University,” however, the group also works to promote inclusivity and openness to all. The group meets weekly inside University Union, as well as hosts a members-only group chat for students to stay connected 24/7. The BSU hosts a number of traditional events each year, from “Ebony Lounge,” a talent showcase in which any student can participate, to “Ebony Excellence,” an award banquet to celebrate black individuals within the community for their service and achievements. To get involved, students can stop by BSU’s office in room 246 in the Union. Greene Turtle is open seven days a week from 11 a.m. to 2 a.m., making it a convenient late night hangout spot. The Greene Turtle in Towson is one of the best places to go during the semester if you’re looking for a fun and affordable way to relax after each week of studying. Located on York Road, the dining franchise is open 7 days a week, from 11 p.m. to 2 a.m. Although you can snag some sports-bar-cuisine classics from this location, the Greene Turtle is most known for its Beat the Clock events, held on Thursdays throughout the semester, where adults can purchase drinks for as low as 50 cents starting at 10 p.m. Additionally, the Green Turtle also provides dance nights, where they clear the main floor of tables around 11 p.m. and host their own DJ-powered dance party. The place is definitely a location to mix and mingle during the semester. The Tigers surprised many with their first return to the playoffs since 2013. When redshirt junior quarterback Tom Flacco transferred to the team last June, there was a buzz about the Tigers that followed them throughout the entire season. Flacco finished the season with 3,251 passing yards and 28 touchdowns. He added 742 rushing yards and four touchdowns on the ground. He also earned several honors, including an All-CAA First Team selection along with being named ECAC Offensive Player of the Year. With Flacco at the helm, the team opened up their playbook with more no huddle and allowed him to make audibles at the line of scrimmage. Head Coach Rob Ambrose looks to build upon this season with a strong recruiting class and remain a viable threat in the Colonial Athletic Association (CAA). 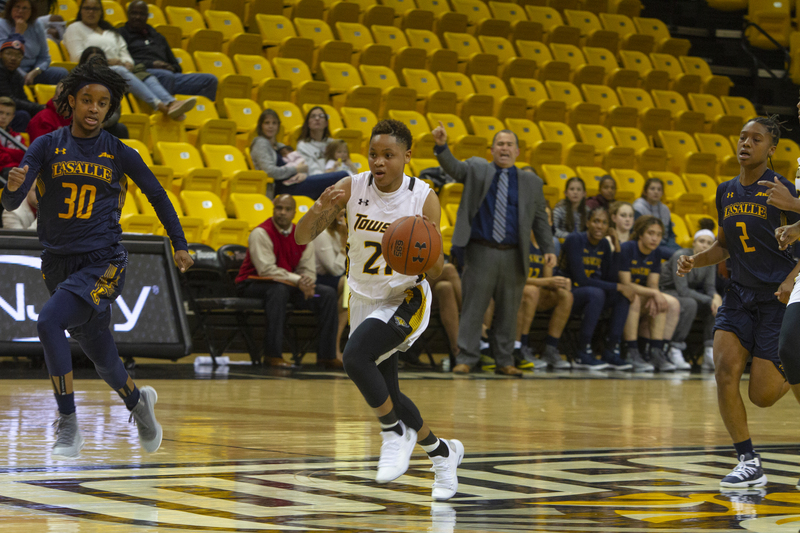 Kionna Jeter has made a monumental impact for Towson, averaging 21.8 points per game on a staggering 46 percent shooting from the field. Oh, and she’s only a redshirt sophomore. Jeter joined the Tigers in June after a strong season at Gulf Coast State College in Panama, Florida where she averaged 19.8 points per game, 6.9 rebounds and 2.1 assists. Head Coach Diane Richardson described her as a “prolific scorer” heading into the season and she certainly hasn’t disappointed, scoring a season-high 32 points in just the third contest of the season. Jeter’s high production has helped the Tigers achieve an 11-6 record so far this season, already marking an improvement from the team’s nine wins last year. She has also made a strong impression on the defensive side of the court, averaging over three steals per game this season. Redshirt sophomore guard Kionna Jeter is averaging a team-high 21.8 points per game this season. In her third season at the helm, Head Coach Diane Richardson is establishing a winning tradition for the Tigers. 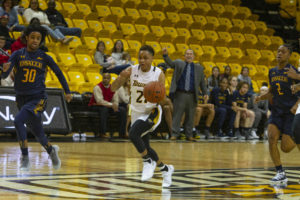 Following a disappointing 2018 campaign, Towson boasts an 11-6 record and places second in the Colonial Athletic Association (CAA) standings. With a balanced roster of upperclassmen and underclassmen, Richardson leads a disciplined team loaded with talent. Redshirt sophomore guard Kionna Jeter carries the scoring load for the team while junior forward Nukiya Mayo and freshman center Janeen Camp lead the team in rebounds and blocks respectively. The Tigers aim to advance in the CAA tournament following a first round exit last year. If you’re looking for a breakfast place with variety in food and drinks, look no further than Towson’s Hot Bagels (THB). THB stays true to its name, offering a bevy of bagels, sandwiches, salads and even muffins. I strongly recommend an egg and cheese bagel sandwich. Not only are they warm and filling, but they’re pretty sizeable too so you can save them for lunch. The store, located near the roundabout at the center of Towson, provides comfortable seating as well and is a great casual dining spot. If you’re in the mood for a drink to boost your day, you can enjoy one of THB’s caffeinated beverages too. THB opens at 6 a.m. on weekdays, so be sure to take advantage of this spot while all the other students are asleep. If nothing else, THB can also be a motivator to get up on time for your 8 a.m. class.